On November 14, 2014 SAVING CHRISTMAS will come out in theaters for TWO weeks only!!! Do not expect an ensemble of star-studded top Hollywood actors in this movie. Instead, Kirk Cameron (I’m assuming) close acquaintances, friends and family to dive deep into the heart of the matter – the commercialism of Christmas. This movie assists Christians to stand strongly against a culture that wants to trivialize and eliminate the faith elements of this holy season. IMBd.com states, “Kirk’s fresh look at Christmas provides Christian the chance to see Christ is where He has always been: at the center of our Christmas celebrations and traditions. 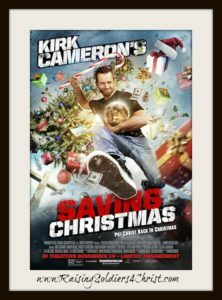 The movie begins with Kirk enjoying the annual Christmas party extravaganza thrown by his sister until he realizes he needs to help out his brother-in-law, Christian, who has a bad case of the bah-humbugs. Christian is unsettled with the huge Christmas tree, the plethora of presents, the Christmas décor throughout his home and the annual festivities his wife enjoys. Kirk’s fresh look at Christmas provides Christian the chance to see Christ is where He has always been: at the center of our Christmas celebrations and traditions. I enjoyed Kirk’s twist on explaining each concern Christian had with the bells and whistles we have grown to accept as part of the Christmas celebration. For example, Christian believes that we have over commercialized this season and lost the true meaning of this time of year – the birth of Jesus Christ. Although I somewhat agree, I was taken back when Kirk began explaining the symbolism of the Christmas tree. I was taught the Christmas tree symbolized the Trinity. All three points of the pine tree we use during Christmas represent the Father, the Son and the Holy Spirit. I still believe that, but Kirk explains it in greater detail. He begins explaining it from the Book of Genesis. God created the Garden of Eden with magnificent trees. Fast-forward to the crucifixion of Jesus on a cross, which was made from a tree. He goes into greater detail, but I don’t want to spoil the message for you. He also explains the manger, the meaning behind the gifts we give, and the swaddling cloth. Kirk did an excellent job in explaining each detail, including Santa! However, I personally think we do have the tendency of over commercializing Christmas. But, after watching this movie and researching Kirk’s explanations, are we truly over commercializing or are we bringing attention to the reason for the season? Each one of us has our own opinions, so I’ll leave that up to you. The end of the movie was a little cheesy, but, again, it’s not a star-studded cast. Kirk Cameron had a vision and he remained faithful to that vision in this movie. It’s hard to fault him for that. There cheesy parts were overshadowed with the detailed explanations and scenes from those explanations that Kirk provided. I thought it was a really good movie. I give this movie a 5/5! Now, finally is the giveaway!!! This is for a Promo Pack coming from Propeller Entertainment! I am sorry I do not have a picture of it but trust me…..you will love it!!! 🙂 It has a CD from the movie, a SIGNED movie poster for Saving Christmas, AND an air freshner that smells like a Christmas tree!!! Good way to get yourself in the Christmas Spirit eh? PS: If you want to see more of how WE do Christmas check out some on my past posts. HERE, HERE, HERE, HERE, HERE, HERE, HERE, HERE, HERE, HERE and HERE. I feel also that Christmas has gotten away from its original meaning. Stores had decorations etc out for Christmas before Halloween. I’m looking forward to seeing this movie with my hubby!